students, small to medium-sized businesses, IT professionals, resellers and consumers that desire a comprehensive digital lifestyle. 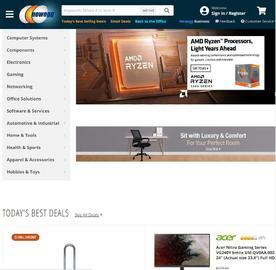 At the Newegg.com website, consumers can find the latest technology parts and products, along with product information, pictures, how-to's, customer product reviews and opportunities to interact with other members of the technology and game enthusiast community. * 1.2% cash back for online purchase. * 0.8% cash back for New Customers - Apple purchase. * 0.4% cash back for Return Customers - Apple purchase. * No cash back on Gift Cards, Loss Leader1, VGA, Video Cards, Video Game Console. Click a Coupon or click Start Shopping to earn Up to 1.2% Cash Back at Newegg.